Stone woke up on the black leather sofa of his office, not entirely remembering what he was doing there. He had an apartment on Southside, but judging from the snare drum blasting through his skull, he’d had about twelve too many the night before and had been unable or unwilling to walk that far. It all started flooding back to him—the murder of the professor, the blonde bartender groupie that everyone suspected but nobody had seen, the expensive bar tab he hoped he had remembered to pay. He opened the cabinet at the bottom of the side table and pulled out a bottle of Fernet Branca, an Italian herbal liqueur that was supposed to prevent or cure hangovers. It didn’t always work, but he tried to always keep a bottle within arm’s reach of anyplace he was likely to crash for the night, whether it be his office sofa, office chair, his actual bed, or his bathroom floor. 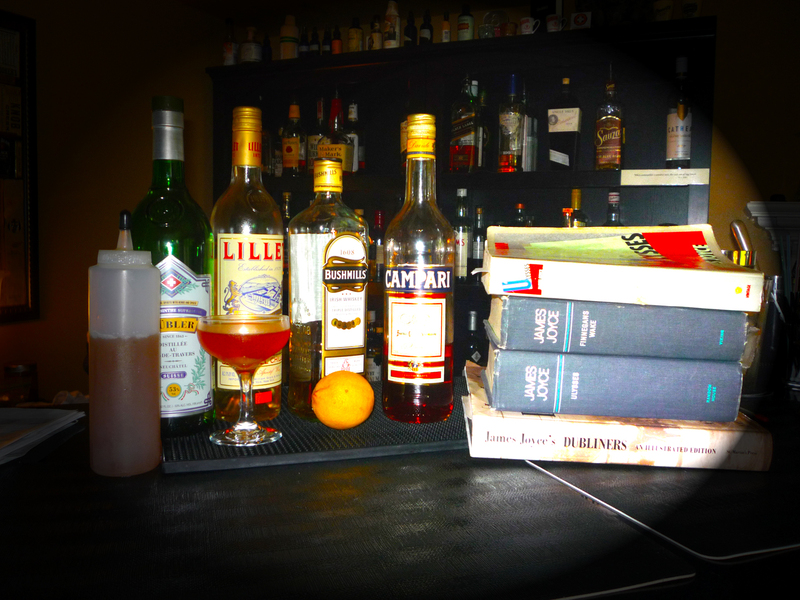 When the Fernet had had a few moments to seep in, he began to sort through the recipe rolodex in his mind for something uncomplicated and fresh, and he decided on a Corpse Reviver #2, a workhorse that originated in The Savoy Cocktail Book from 1930, a copy of which he kept handy on the bookshelf above his liquor cabinet. With equal parts dry gin, Cointreau, Lillet Blanc, and fresh lemon juice, as well as a dash of absinthe for zing, it was just the thing to bring him back to life after the events of the night before. He always kept fresh lemons and limes in a mini-fridge in case the need arose. As he was squeezing the lemon, Stone’s thoughts were interrupted by a note slipped under the door. It was a flyer for some sort of poetry reading happening later that night called Nitty Gritty Magic City. It was free, and maybe there would be drinks. He folded the paper into his wallet so he would remember to look at it again later. They call Birmingham the Magic City. To the locals there’s no worse cliché, but to a stranger in town, this enigmatic epithet provided a certain understanding and attraction that would otherwise elude. When Stone lived in New York, party people would ask him, “Birmingham? What’s that like?” He would sigh… as if such a question could be answered without summarizing a hundred years of violent history. So he would simply say that they call it the Magic City and leave them to wonder about it. The poetry reading would be held in a storefront in the basement of an old Masonic lodge in the old Woodlawn neighborhood, just east of downtown. Nitty Gritty was a good descriptor for this part of town, a formerly middle class neighborhood that had gone to seed, though in recent years a few people had been trying to build it back up, filling the empty buildings with useful things like art galleries and recording studios. By day, the store hosting the poetry reading posed as a purveyor of survival supplies, though it was actually the headquarters of a creative writing and tutoring center for area kids. It was a cute idea, and an ideal space for writers to utilize at night for events. The last drops of his Corpse Reviver #2 slipped down his throat like honeyed butter on roller skates. His office door was open just a crack, and when someone knocked on it, it creaked open. The warthog silhouette of Detective Gatlinburg of Birmingham’s finest stood lingering in the doorway, backlit by the frazzled fluorescent bulb in the hallway that buzzed off and on, day and night, like a broken strobe in a hellish discotheque. Stone wasn’t fond of overhead light of any kind, so his office was lit entirely by floor and desk lamps, casting a warm amber glow over whichever part of the office needed visibility, which was currently his liquor shelf. It was true that when they had previously collaborated, Stone had fabricated the cat as an excuse for being in a place where he wasn’t supposed to be. He had a bad habit of being elusive with Detective Gatlinburg even when it wasn’t necessary. However, since then, he had acquired an actual orange creamsicle tabby whom he called by the name that had spontaneously popped into his head that day two years before, Captain Fancypants. For the next hour or so, he did his best to answer the detective’s questions about the night before, though some of it was rather fuzzy now in the light of day. For his part, the detective didn’t give up any interesting information about the case to Stone. When he finally left, Stone took another shot of Fernet to fortify him for the walk across town to shower, change his clothes, and, of course, put out a can of cat food for the Captain. 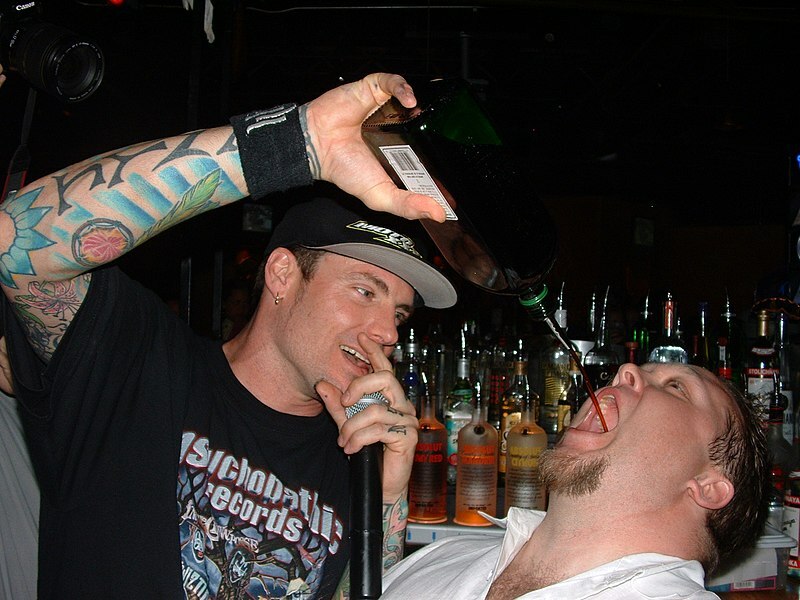 From Wikipedia: Vanilla Ice serving Jager to a fan whilst performing his one hit song. Jägermeister often gets a bad rap. Whether consumed in shots or the abomination known as the “Jäger bomb,” it is often associated with idiot frat boys who get into bar fights. At 70 proof, Jäger’s reputation for being a “manly man” drink is undeserved, but their own advertising perpetuates this image, which is sad. Very sad. When you try it with an open mind next to Italian amari and French apertifs, Jägermeister is not all that different. It has a sweet, herbal flavor with hints of menthol that can be used to enhance craft cocktails. From Wikipedia. Seems more civilized already, doesn’t it? Fernet Branca is a very bitter Italian amaro, which some bartenders have characterized as “Jägermeister’s older, more sophisticated brother.” It is very popular among people who work in the service industry, which is why it is also known as the “bartender’s handshake.” Fernet is great for digestion and has many curative properties. 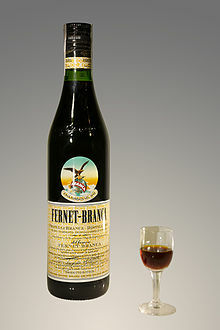 Some people will have a shot of Fernet at the end of a long night of drinking to help ward off a hangover the next day. We would hate to see Fernet abused in the same way that Jägermeister often is today. We have seen the beginnings of such a trend already, and it is disturbing to see this happen to such a fine product. We would love to see more bartenders use Jägermeister to its potential in craft cocktails. Here are some cocktails we’ve made at home using Jägermeister. We love to add a splash of just about any amaro or herbal liquor to a Manhattan to help round it out, so our first offering uses Jägermeister to a similar effect. The other two take advantage of the distinctive menthol flavor in the Jägermeister, first complementing it with sweetness and then with smoke. Although we enjoy a shot of Fernet on its own as much as anyone else, it can be used to good effect in cocktails as well. The Toronto is a simple but elegant classic that adds a quarter ounce of Fernet and an equal amount of simple syrup to two ounces of rye. 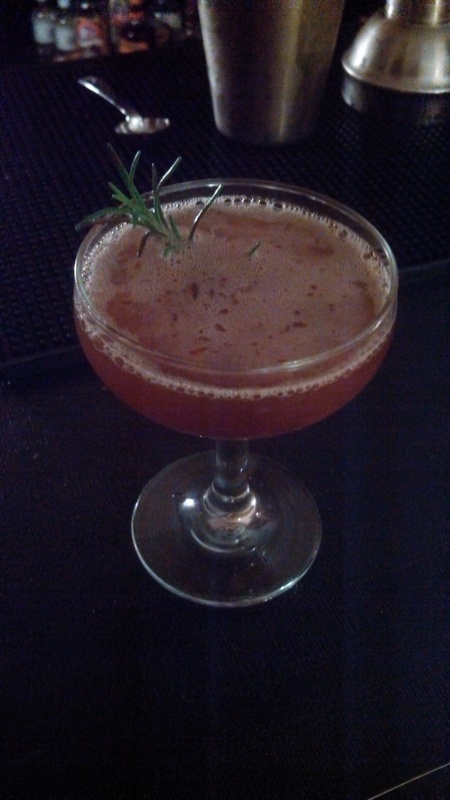 The Beatnik is a Manhattan variation that uses two ounces of rye, an ounce of tawny port, and a quarter ounce of Fernet. You’ll notice most recipes that use Fernet include only a quarter ounce or a dash. A little bit goes a long way. Stir and strain all liquids into a cocktail glass. Express the oil from the orange peels into the drink and then discard.